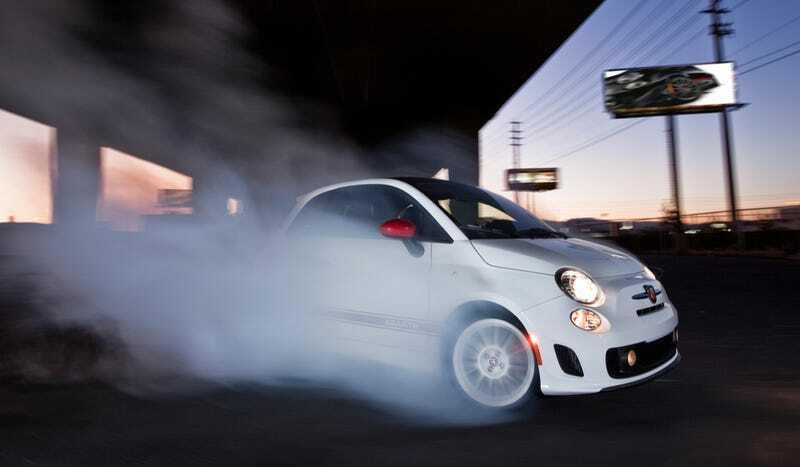 The Fiat 500 Abarth is one of my personal favorite cars. It's a funky little hot rod that is also one of the best sounding cars on the market. It's also only available with an old fashioned manual transmission. That last part is about to change. In order to appeal to a broader customer base for the wee angry hatch, Fiat is preparing to offer the car with an automatic gearbox. That's right, a gearbox that shifts gears for you so you don't have to. A novel idea. Fiat says this (along with the introduction of the 500C Abarth) will help move the sales mix from 80 percent males to include more women, as well as men who can't drive stick. I know everyone around here will call for Fiat's head and start burning 500 Abarths at the stake for this act against the God of manual transmissions, but I'm all for this. Look, there's nothing wrong with making a performance car accessible. And more than that, a world with more 500 Abarths on the road is a world I want to live in, and I bet all of you would like to live there as well. Sell as many as you can, Fiat. Do it for us.